A new tape recording of The Beatles' John Lennon, Paul McCartney and Ringo Starr chatting and breaking into giggles during an early recording session has been discovered and will be auctioned off next week. On one part of the half-hour Beatles tape, John Lennon and Paul McCartney repeatedly collapse in laughter as they try to complete the song I'll Follow The Sun. The tape also features versions of I Feel Fine and an unreleased track called Don't Put Me Down Like This. "When you listen to the recording it makes your skin tingle because it's from a period of time when The Beatles were still friends, it's early Beatles," said auctioneer Jon King. "You can hear John, Paul and Ringo having a joke and a laugh together. They are laughing because they can't get a song right." The tape is expected to sell for $16,000 to $24,000US at an auction in Midgham, about 45 miles west of London, on Tuesday. 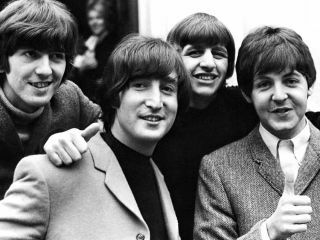 What with another rare Beatles tape recently found in a garage, MusicRadar is currently going through our basements, closets and garages. We just might dig up our lawns too.